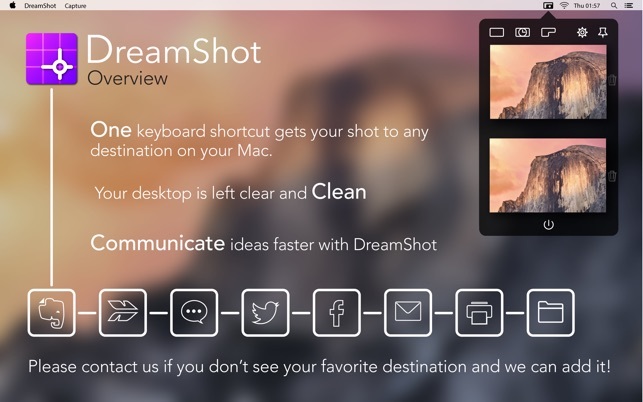 * Stop cluttering your desktop with screenshots — DreamShot lets you send them directly where you want, with one single keyboard shortcut. * Each screenshot taken on your mac has a unique purpose. A specific reason for the capture. You need a method of taking screenshots that accommodates for all use cases, not just one or two. * DreamShot becomes the brains of your screenshot workflow, presenting the most relevant options for dealing with your image. 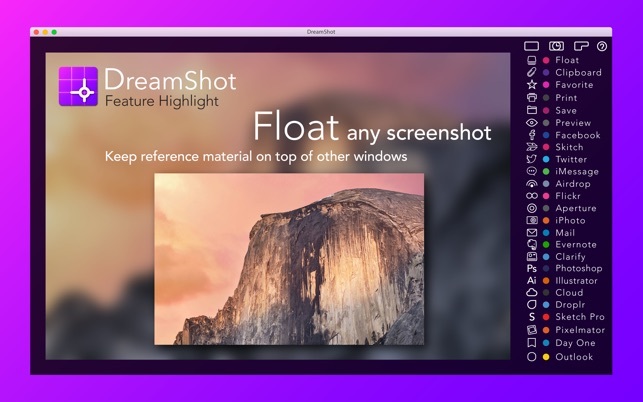 You select a destination, DreamShot sends it, then gets out of the way, with nothing left on your desktop. Try it once, and you’ll never go back. * When you capture an image with DreamShot, you are instantly presented with a large preview of the shot, and a list of options that is generated from the apps and services you use on your Mac. Send the capture anywhere with only one click. You can even print, copy to clipboard, send to Dropbox, custom folders, social networks, or any place that supports image import on your Mac. 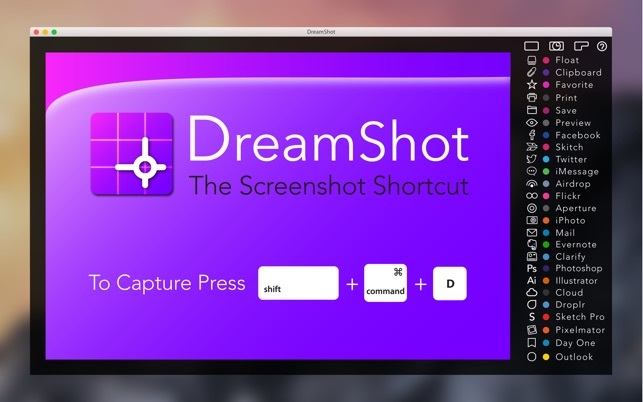 * DreamShot frees your mind from the dozens of shortcuts required to work with screenshots on a Mac. Apps like Evernote, Skitch, Droplr, Cloud, and Voilà all have their own associated shortcuts to remember if you want to send a shot to them. Now you will be able to go to one place, with one shortcut, and have it adapt to why you are taking a particular screenshot, each and every time. 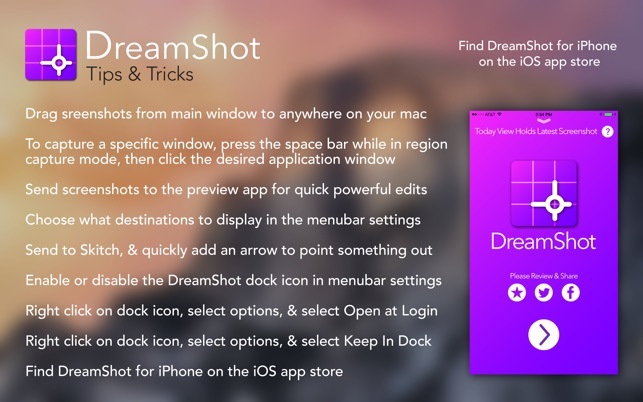 * Sync your shots between Dreamshot on the Mac and the IOS version. Even viewing your latest shot from your Mac on your Apple Watch. Convenient for referencing a quick bit of info on the go. * Capture with Shift+CMD+D or any custom shortcut you choose. * The menubar panel holds your previous screenshots for easy reuse. * Drag a screenshot from the preview window to anywhere on your Mac. * Hide unwanted destinations from view. * Set a 'Favorites' destination to any place on your Mac. * Instantly see a large preview of your screen capture and retake if needed. * Instantly print, save, copy to clipboard, or open and edit preview. * Responsive developers that love to hear from you! 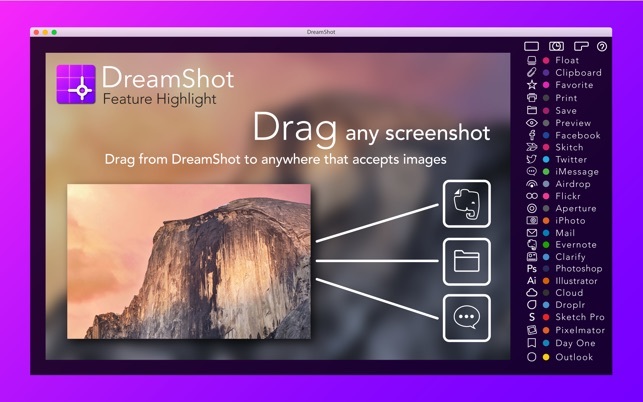 DreamShot All Access Subscription: All Premium Features Unlocked! A $1.99 per Month / $23.99 per Year purchase will be applied to your iTunes account when signed up during or at the end of the 30 day trial period. A $1.49 per Month / $17.99 per Year purchase will be applied to your iTunes account when signed up during or at the end of the 30 day trial period for the DreamShot Global Galleries feature. Subscriptions will automatically renew unless canceled within 24-hours before the end of the current period. You can cancel anytime with your iTunes account settings. Any unused portion of a free trial will be forfeited if you purchase a subscription. For more information, see our http://silverbeechstudios.com/terms-and-conditions/ and http://silverbeechstudios.com/privacy/. 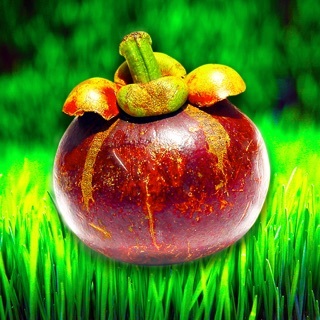 * I have to say that this application is amazing! * This App is a dream for my software testing. Not only does it give you quick access to multiple save/share/export options, but the simplicity is just a breath of fresh air. I use iMessage 24/7 and this app is a huge help when I need to take and post photos quickly of what I'm working on. * 5 stars!!! 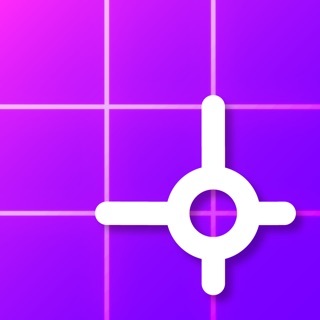 AWESOME APP!! Thanks again! Note: v2.5.1 Just released and it still doesn’t work but this time it crashes after the click and when choosing ‘reopen’ it crashes again. This, if anyone cares, is on a 27” Retina iMac with 2 screens. If the developer wants the problem report just ask. I’ve tried to contact them over a dozen times and can’t get a response. They raised the price by $2 and it still doesn’t work. I was hopeful when I saw the capture cursor, but when I dragged over the area I wanted to capture and hear the encouraging shutter sound…. that was it. No window, no interface, no direction as to where the screen show was, nothing! I even tried booting into Sierra usng safe boot holding down the shift key to see if something was getting in the way, but that didn’t fix anything. I’ve been trying to contact SilverBeech Studios for at least a month, but there’s no one home. So unusable and no support. Hi, thank you for the review. We do apologize for the long delay on updates. Many things were standing in the way of bringing DreamShot back online. We have recently been able to rebuild this great app from the ground up! This offers massive stability improvements as well as more features and there are more to come! Please feel free to download this new version as it should resolve any issues you may have. If you run into any other issues, or have feature requests, please reach out to us at support@silverbeechstudios.com and we will look into the issue right away. This app truthfully makes my life exponentially easier. I use it activley for my studies, mostly for quick copy/paste actions as well as to send images to friends. The main point I’d like to make here is that it is phenomenal!! Seeing some comments here I notice that people have issues/lags with it. I’m still on OS El Capital (LOL) so maybe that’s why I havent had issues with it. Regardless, 100% worrth the buy. I hope the developers keep making great apps! Hi, thank you for the review! We have released a new version recently that should provide great power and stability above the old versions. Please feel free to download this new version! Thanks a lot! I used Dreamshot to copy/paste screenshots of tables into Excel spreadsheets. Prior to the new release of version 3 this worked adequately. The only drawback was the memory size of the screenshot capture was quite high compared to tools such as SnagIt, but otherwise it functionally worked. With the new release of version 3, though, I am no longer able to copy/paste screenshot captures into Excel. I get a message that the capture is copied onto the clipboard, but that seems to be an error as no image actaully makes it onto the cliupboard, thus nothing is pasted into Excel. The user support seems nonexistent. No response to email inquiry made. Hi, we're sorry for the trouble you're having. This issue has been resolved in version 3.1.0. Thanks for bringing this to our attention! If you find the update working to your expectation, please take a few moments to update your review. Reach out to support@silverbeechstudios.com with any other questions or concerns.